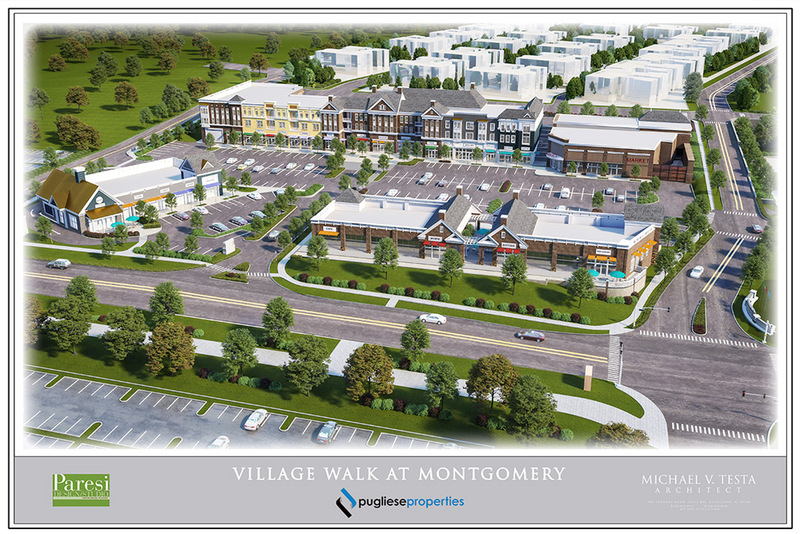 The Village Walk at Montgomery is a mixed-use development incorporating retail, office and residential space. It will include five buildings. A 31,720 square foot three-story building with retail space on the first floor and residential apartment units on the second and third floors. A 12,000 square foot anchor building as well as three additional multi-tenant pads. One of the pads will include a drive-thru. When complete, the Village Walk will consist of 92,000 SF of retail/Restaurant space, 52 apartments and 8000 SF of office space. As part of the master plan, the Village Walk will be connected by roads, bike paths and pedestrian walkways to the new Montgomery Crossing residential development as well as the existing Tapestry and Hillside housing developments. Also provided is easy access to NJ Transit bus service to downtown Princeton, train station and other destinations. Vince Pugliese commented, “We are very excited to be a major part of the redevelopment of downtown Montgomery”. “We have worked together with the Township Planners over the last several years incorporating the latest design and architectural features, creating a destination that will benefit the local business and residential community”, Pugliese added. Located 3 miles north of downtown Princeton, Montgomery is a thriving community with a rich history, blue ribbon schools and diverse recreation opportunities. The town has successfully merged rural and suburban lifestyles in a cosmopolitan region. For further information on The Village Walk at Montgomery please contact Pugliese Properties at 609-356-0279 or visit us at puglieseproperties.com. Founded 40 years ago in Princeton NJ, Princeton Nassau Pediatrics has grown to multiple locations throughout Somerset and Mercer counties including West Windsor, Monroe and Pennington. In addition to Allstate, additional tenants at the center include Wells Fargo, Genteel’s Brick Oven Trattoria, Nonesuch Framing, Mori Sushi, Kiki D’s Dress Shop, Rodeo Nails, Metro Male Barbering, Ricky’s Thai, Lili B’s Boutique, Moo Yah Burgers, ReMax, Agape Dental and Plastic Surgery Arts of NJ. Slices Pizzeria and Bistro joins other tenants in the center including Dunkin Donuts, Verizon Wireless, KFC/Taco Bell, Wine & Spirits Shoppe, Yo Pu Chinese Restaurant, NE Eye Institute and Tobacco Road. Neighboring retailers include Weiss Supermarket, Rite Aid, CVS, McDonald’s, Auto Zone and Tractor Supply. Hamlin Plaza, LLC is an affiliate of Pugliese Properties, a Princeton-based real estate investment, management and development company. Pugliese Properties is seeking to acquire neighborhood shopping centers and single tenant net leased properties in the New Jersey/Eastern Pennsylvania area. For further information contact Pugliese Properties at 609-356-0279. (Princeton, NJ April 25, 2017) The Sherwin-Williams Company has opened a new retail store in the Honesdale Shopping Plaza in Honesdale, Pennsylvania. The newly redeveloped Honesdale Shopping Plaza was a former Chrysler dealership and is located at 250 Grandview Avenue (Route 6). The retail strip center has excellent visibility and easy access onto Route 6, which is the main retail/commercial corridor in the area. “We are pleased that Sherwin-Williams has chosen Honesdale Shopping Plaza for their new regional store and look forward to their Grand Opening on May 13,” stated Brett Pugliese. The Sherwin-Williams Company, founded in 1866, is headquartered in Cleveland, Ohio. The Paint Stores Division has over 4,100 stores nationwide. The company employs more than 42,000 and its stock is traded on the NYSE. Sherwin-Williams has a Standard & Poors credit rating of “A”. Honesdale Shopping Plaza, LLC is an affiliate of Pugliese Properties, a Princeton-based real estate investment, management and development company. Pugliese Properties is seeking to acquire neighborhood shopping centers and single tenant net leased properties in the New Jersey/Eastern Pennsylvania area. For further information contact Pugliese Properties at 609-356-0279. The John Heinz Institute joins other tenants in the center including Gertrude Hawk Chocolate Shop, Subway, Dollar General, Budget Blinds, Beijing Restaurant, FNC Bank and Sickler’s Bike and Sport Shop. The John Heinz Institute is a division of Allied Services. Allied Services is a leading provider of healthcare and human services in northeastern Pennsylvania. Kingston Village Center, LLC is an affiliate of Pugliese Properties, a Princeton-based real estate investment, management and development company. Pugliese Properties is seeking to acquire neighborhood shopping centers and single tenant net leased properties in the New Jersey/Eastern Pennsylvania area. For further information contact Pugliese Properties at 609-356-0279. One surprising feature is that they’re appealing not just to millennials in search of a community living and working environment, but also to seniors and empty nesters. This broad appeal has towns loosening traditional zoning laws to encourage this type of development with the intention of reducing traffic and keeping tax revenue’s local. As a result, developers are competing for these projects; often benefiting from fast tract approvals and tax benefits. Based in Princeton, New Jersey, Pugliese Properties is a fully integrated commercial real estate acquisition, development and management company. They own and manage a portfolio of shopping centers and commercial buildings throughout New Jersey and Eastern Pennsylvania.